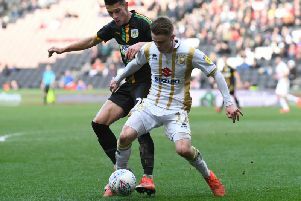 Kieran Agard would love to continue his climb to becoming one of MK Dons all-time leading scorers, but would be far happier helping the team to promotion this season. The striker netted his 17th of the season on Saturday when he poked into an empty net for the only goal of the game against Crawley, drawing him level with Sam Baldock on 33 league goals. With Dons remaining two points outside the automatic spots, Agard's goal, helping Dons to their fourth win in a row, ensures they remain in the hunt, and rather than aiming for the top of the scorers list - currently occupied by Izale McLeod with 71 - would sooner help fire Dons back to League 1. He said: "It would be nice to be (Dons' leading scorer), but I want the success for the team more than personally. As long as we keep winning, I'm more than happy. "I've always said I just want to take it game by game, helping the team as much as I can. If I score as many goals as I can, it will only be good for the team. I'll keep working hard to score goals. The team is now creating chances for me to score these goals." Agard's goal on 41 minutes came after a disastrous piece of defending from Crawley captain Dannie Bulman, who ducked out of the way of Stuart Moore's long ball forward to allow the striker to round the keeper before poking in. Talking through the goal, Agard said: It was a long ball up field, but it had to be played for me to get on to it and anticipate it. Game after game, we are creating chances. "Fair play to Stu, he's put the ball up there and I've got on the end of it, and I think he'll take that as well! "I was at full-stretch, I thought it was going wide so I threw myself at it and luckily I got enough on it to put it into the empty net! The post didn't come into my head, I was just looking to redirect it and I'm glad to see it go in."